William Bridges - A Bridge Over Troubled Water? 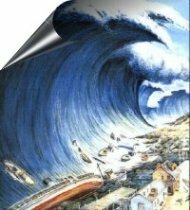 William Bridges focuses on transitions and the psychological changes that lie behind behind significant organisational change. 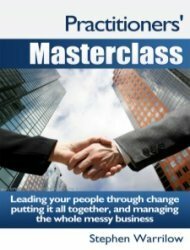 In the best-selling "Managing Transitions" Bridges provides a clear understanding of what change does to employees and what employees in transition can do to an organisation. He addresses the fact that it is people who have to carry out the change. 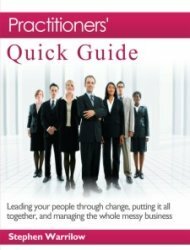 When the book was originally published a decade ago, Bridges was the first to provide any real sense of the emotional impact of change and what can be done to keep it from disrupting the entire organization. 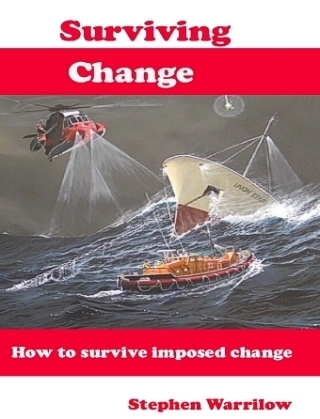 Bridges maintains that the situational changes are not as difficult for companies to make as the psychological transitions of the people impacted by the change. This man is really talking my language as it is the people related issues that lie behind the staggering and consistent 70% failure rate of all significant organisational change initiatives. (3) The New Beginning - helping people develop the new identity, experience the new energy, and discover the new sense of purpose that make the change begin to work. Unlike earlier models such as Kurt Lewins, which speak of institutionalising or "freezing" behaviors, Bridges' attention is focused on helping people discover, accept, and embrace their new identities in the new situation. 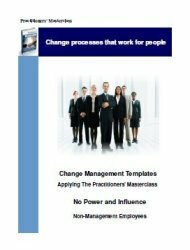 This is the first example of an increasing number of strategies for managing change that recognise the basic psychology of change at the personal level, and that is people centred. He also theorises how these life stages can become a constant cycle of organisational renewal via the creation of a culture that embraces and nurtures change as a way of life. A wonderful dream - in my view - but let's get "one in a row" right first! 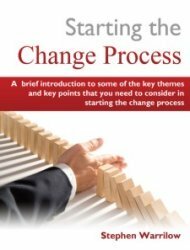 In my view, William Bridges' change model addresses many of the causes of the 70% failure rate in change management, and it resonates with and is totally consistent with the holistic and wide view perspective of a programme based approach to change management. For more on this: " William Bridges - Navigating Change "